Shadow Ranch is a master-planned, gated community built by Family Development in Indio California.Most of the homes were built within the last 10 to 15 years and feature for three, four, and five bedroom layouts from 2500 ft.² to 3200 ft.². Lot sizes are about a quarter of an acre. Homeowners dues are approximately $120 per month, which covers all common area landscaping and secure entrance. ( the HOA may have changed since the publishing of this page so check with current listings for exact association fees and dues). This master-planned community consists of single and double story homes offering up to six bedrooms and 4 1/2 bathrooms. There's plenty of room for everyone a Shadow Ranch. Most of these homes feature large covered patios, 8 foot high exterior doors, maple cabinetry and walk-in pantry. The larger lots allow for plenty of extra space for swimming pools, spas and outdoor entertainment. The community has a neighborhood park and plenty of walkways. Shadow Ranch is in the Imperial Irrigation District, which offers lower electricity bills and is also in the Desert Sands Unified School District. Residents with school age children typically utilize the Dwight Eisenhower elementary school and the Desert Ridge Academy. This is one of the lowest homeowners association dues in the area and there are no Mello Roos fees for properties within Shadow Ranch. 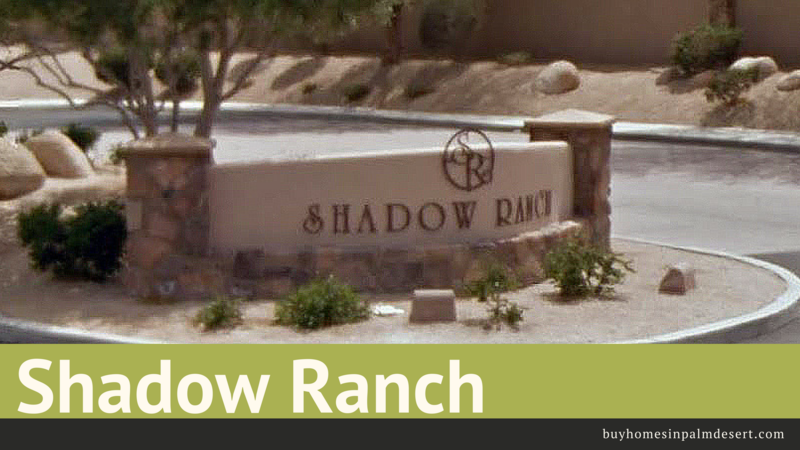 Home prices for Shadow Ranch typically range from $300,000-$420,000 based on size, lot size and condition. The location is just off of Avenue 42 with the Indio Town Ctr., Winco foods, shops and restaurants as well as a 24 Hour Fitness just to the west of this development. Interstate 10 is just a couple of minutes down Jackson Street from this community. To learn more about Shadow Ranch view available listings on our website for free here or contact my office to schedule a showing at any time. Desert Area MLS listings last updated Apr 22, 2019 11:00:am.